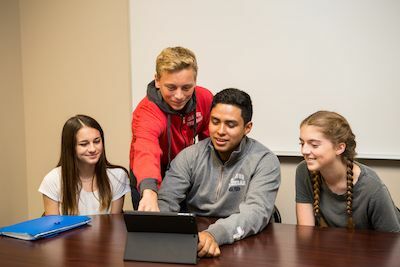 Orange Lutheran Online (OLO) has been a leader in Christian online education for over a decade and offers a selection of courses in all departments to allow students to broaden their academic experience and customize their learning schedules. We currently offer 51 courses, with core courses that are NCAA and UC approved and numerous elective and dual credit options. Our courses are designed to meet iNACOL standards for quality online courses and are taught by our own highly trained teachers. Online Advanced Placement (AP) courses are available, and we continue to add AP and Honors level courses through our online portal each year. Orange Lutheran Online (OLO) offers classes approved by the National Collegiate Athletic Association (NCAA) and University of California (UC) system. OLO offers several options of introduction to online classes for students' school schedules. Students can take all of their courses online or select a “blended” schedule consisting of four campus classes and three online courses. Campus students can take a single online course to free up their campus schedule for extracurricular activities. Orange Lutheran Online mirrors the high quality academic structure and teaching methods of traditional classroom learning, with a convenient and flexible format. OLO Spring 2 finals are Monday, May 20th and Tuesday, May 21st in the Learning Commons. Students can find their OLO final time and date outside the OLO office or in their online classroom. The last day to make changes without a 10% grade deduction is Friday, May 10th. Online dual credit classes offer our students an opportunity to demonstrate the pursuit of a passion outside the confines of the master bell schedule. Electives are the main focus of these selections. 3 or 4 college credits can be earned over a 15 week semester (CUW) or 7 week semester (GCU), as well as a year of high school elective credit. The college credit is directly applicable to Concordia and Grand Canyon, and may be transferrable to other colleges. Please see your OLO advisor for details. Algebra Bridge Online is a three-week course (15 days) covering second-semester Algebra 1. The course is taken as a refresher or review of an Algebra 1 course previously completed. Algebra Bridge is specifically designed to review the major concepts of Algebra, especially in the second semester. Students receive no credit for this course, but based on their grade are able to enroll in Geometry or Honors Geometry on ground. Students must pass the course with a 70% to enroll in Geometry or they must pass the course with an 85% to enroll in Honors Geometry. The course is mastery-based, meaning that each concept must be mastered before moving on to the next concept. Students can expect to spend approximately four hours per day reviewing and practicing concepts, checking their understanding, and taking checkpoints and exams. Each checkpoint and exam can be taken unlimited times, but students must score an 80% or higher to move on to the next concept. It will be run as an independent study, self-paced class monitored by an online math teacher.